Updated 9/16/18. 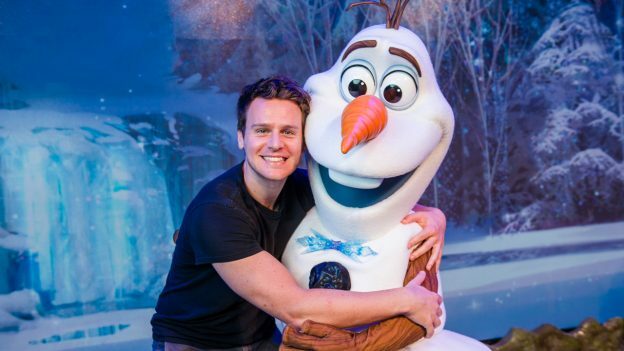 Meeting your favorite characters is just one perk of visiting Walt Disney World. You can take pictures with them and get an autograph with your favorite princess, mouse, and live action film stars from beloved movies such as Star Wars and Guardians of the Galaxy. 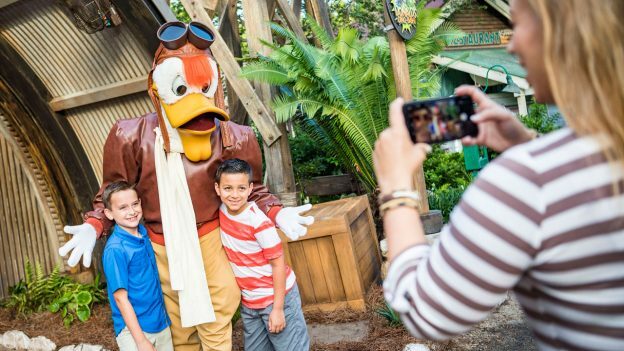 Here are some tips on Walt Disney World character meet and greets for each park, including Magic Kingdom, Disney’s Hollywood Studios, Disney’s Animal Kingdom Theme Park, and Epcot. Mickey Mouse is a popular character to meet and often makes the top list of Walt Disney World character experiences. You can meet Mickey Mouse at the Town Square Theater on Main Street, U.S.A. Guests can also meet some of Mickey’s pals as Circus Stars at Pete’s Silly Sideshow. Here guests can hang out with Donald Duck, Minnie Mouse, Daisy Duck and Goofy. Main Street, U.S.A. is wonderful place to meet Mickey’s pals, such as Pluto. The Magic Kingdom is celebrating Incredible Summer Fun in honor of Incredibles 2. Guests can meet Mr. Incredible, Mrs. Incredible, Frozone and even Edna Mode at the Incredible Tomorrowland Expo. The princesses are always a popular meet and greet and another top list favorite for Walt Disney World character experiences. Guests can meet Ariel from The Little Mermaid at her Grotto in Fantasyland as well as Cinderella and Elena. Merida from Brave can also be found at Fantasyland. Princess Tiana, from Princess and the Frog, and Rapunzel from Tangled will be at Princess Fairytale Hall in Fantasyland. Fans of the villain, Gaston, can be awed and inspired by him at his Tavern. You can celebrate your un-birthday with Alice in Wonderland and the Mad Hatter at the Mad Tea Party in Fantasyland. Winnie the Pooh and friends can be found near the Many Adventures of Winnie the Pooh. Here you can meet friends, such as Tigger, in a nice, shady place in the Hundred Acre Wood. Princess Jasmine and Aladdin are in Adventure Land and share stories of their kingdom, Agrabah. Guests can their favorite Toy Story characters in Tomorrowland, such as Buzz Lightyear, Woody, and Jessie. Pirates and fairies are also a popular meet and greet. Guests can meet Disney’s favorite pirate, Captain Jack Sparrow, in Adventureland. Junior pirates can also be “recruited” to begin training to sail the seven seas. Guests can meet Peter Pan and Wendy in Fantasyland, and Tinkerbell at the Town Square Theater. Guests just need faith, trust and pixie dust! 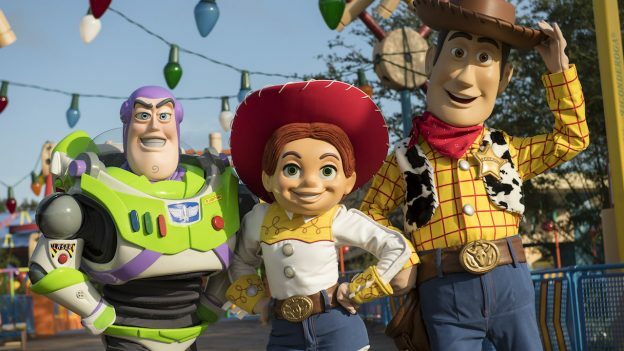 Toy Story Land just opened and here guests can meet and greet Buzz Lightyear, Woody, and Jessie and watch the Green Army Patrol. Guests will enjoy this experience to infinity and beyond! 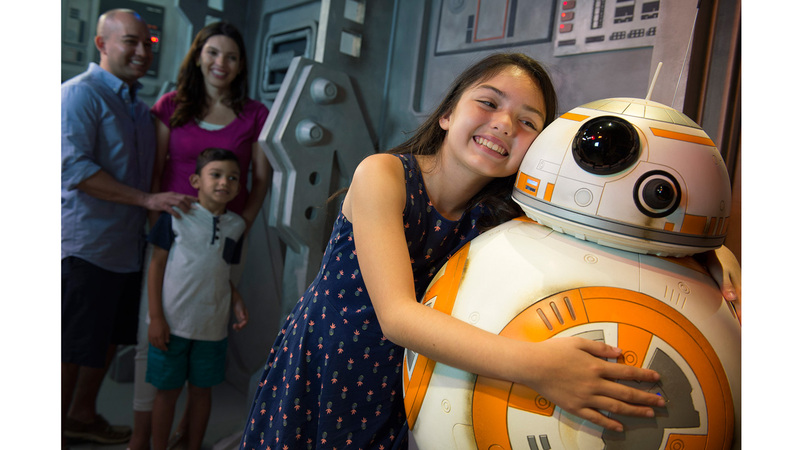 Star Wars fans can meet BB-8, Kylo Ren, and Chewbacca at the Animation Courtyard. You might even spot some Storm Troopers as Captain Phasma and her Storm Troopers demonstrate the First Order’s strength and obedience. Guest can meet their favorite race cars in Disney’s Hollywood Studios, including Lightening McQueen and Cruz Ramirez. Guests can also meet their favorite snowman, Olaf, in Echo Lake. Guests can meet Donald, Daisy, Goofy, Pluto and Chip ’n Dale in their all-new dino-inspired costumes in DinoLand U.S.A.
Russell and his furry sidekick Dug from the movie, Up!, can be found in Asia. Don’t forget to earn your Wilderness Explorer badge! Discovery Island in Disney’s Animal Kingdom Theme Park has the Tree of Life where guests can see beautiful Macaws take flight. Here guests can also meet and greet Mickey and Minnie at their exploration headquarters. Guests can also meet Pocahontas in Discovery Island as she greets guests with open arms. The Doc is in! 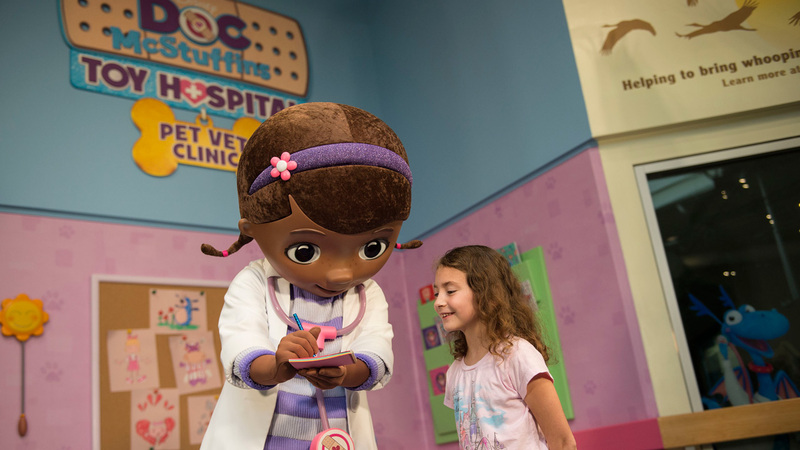 Younger guests will love meeting their favorite toy doctor, Doc McStuffins, in Conservation Station. Doc is hanging out in her stuffed animal clinic and is happy to sign autographs and take pictures. Rafiki guided Simba in The Lion King, and is now available for meets and greets at Rafiki’s Planet Watch. Do you want to build a snowman? Epcot’s World Showcase has two of Frozen’s beautiful princesses, Anna and Elsa. The World Showcase also includes Alice in Wonderland so you can learn about her curious adventures in Wonderland. Guests can also meet Snow White, the fairest of them all at the Germany Pavilion in the World Showcase. Belle can be found at the France Pavilion with adventure in the great wide somewhere, and Princess Jasmine is at Morocco. 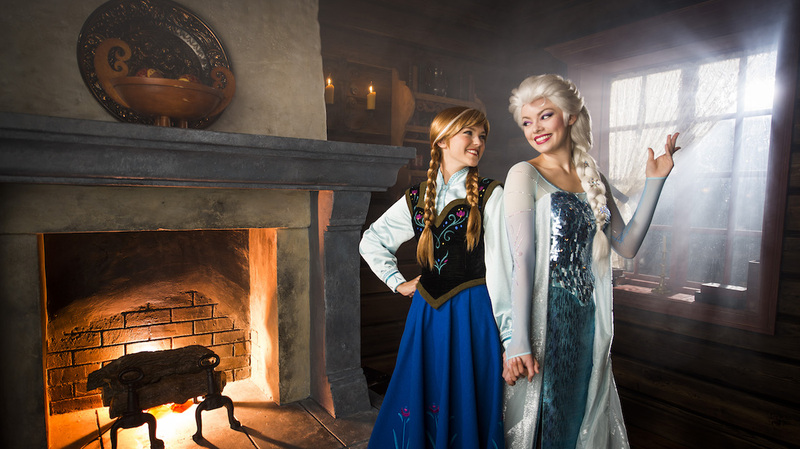 At the Royal Sommerhus guests can also meet and greet the beloved sisters, Anna and Elsa, from Arendelle. Guests can watch their favorite Guardians of the Galaxy at the Guardians of the Galaxy – Awesome Mix Live! This show takes place at the America Gardens Theatre in World Showcase. Star-Lord and Gamora from the “Guardians of the Galaxy” join forces with a live band in this musical journey. Meet Cinderella and other class princesses in Fantasyland. Princess Tiana and Princess Naveen oversee this desert and riverboat cruise. This experience also comes with a special viewing location of the Disney Festival of Fantasy Parade. Visit with your favorite Winnie the Pooh characters in Magic Kingdom. Enjoy a family feast with Chip ‘n’ Dale and other favorite Disney characters in Epcot. Enjoy a royal meal inside a castle with your favorite Disney princesses at the World Showcase in Epcot. Choose from a breakfast or lunch buffet to enjoy a meal with Disney Junior characters or (depending on seasonal offerings) Minnie Mouse and friends in Disney’s Hollywood Studios. This wild buffet themed experience features Safari Donald Duck and friends in Animal Kingdom. There are plenty of Walt Disney World character dining options to take advantage of at the Walt Disney World theme park hotels! You don’t have to be a guest of the hotel to enjoy these character dining experiences. Reservations for Character Dining are recommended when planning your Walt Disney World character experience. Book in advance by calling (714) 781-3463. Disney App – This app is an asset because it gives you up-to-minute character locations and times. For more helpful Disneyland planning advice and exclusive discounts on tickets, hotels, and food, make sure to subscribe to our newsletter.